Salvadoran deportees arrive at La Chacra Immigration Center in San Salvador, El Salvador, June 28, 2018 (AP photo by Salvador Melendez). SAN SALVADOR—At around 2 a.m. on a Sunday this past May, Ricardo Canenguez sent his girlfriend, Damaris Perez, a text message with a license plate number. The plate belonged to the car of a police officer who, Canenguez said, had harassed him—and struck him—for no apparent reason while he was out at a bar that night. The 40-year-old Canenguez spent most of his childhood and adolescence in Los Angeles, but he had been living in his native El Salvador since being deported in 2001. He had tattoos all over his arms, something many Salvadorans associate with street gangs. For this reason, he had frequent run-ins with the police, Perez recalls. Canenguez had never gotten used to the police harassment, and on this particular night he decided he would take action. “We’re going to file a complaint against this license plate number,” he wrote in a text message to Perez, who is 24. He called her shortly after sending the message, and they decided he would go to Perez’s house, where she was spending the night. Listen to Anna-Catherine Brigida discuss this article on WPR’s Trend Lines Podcast. Her audio starts at 23:11. Perez awoke three hours later to go to her job at a call center. Canenguez said he could drive her, but she told him to stay behind; he was still drunk from the night before. He obliged and stayed at her house, but agreed to pick her up after her shift ended that afternoon. The couple remained in contact via text and calls until around 12:30 p.m., when Canenguez told her he was heading into the city and would pick her up when her shift ended at 4 p.m. That was the last she ever heard from him. Leaving the call center, she waited outside for about half an hour, but he never showed up. When she called his phone, no one picked up. At around 4:30 his phone was either shut off or out of service. Perez took the bus home. At first, Perez thought Canenguez’s phone might have died. But it also crossed her mind that he could have been taken into police custody. His mother, who lives in the United States, soon began calling and messaging, frantically seeking information about her son. The women received no answers that night. Perez went to sleep still wondering what had happened to him. It wasn’t until 8:30 the following morning, a Monday, when she got a text message from Canenguez’s mother: He was dead. Local news reports citing the office of El Salvador’s attorney general said Canenguez been killed in an enfrentamiento, or shoot-out, with police in Nejapa, an area just north of San Salvador. The reports identified him as a gang member. Perez and Canenguez’s friends and family were in disbelief, insisting he was never involved in any criminal activity in El Salvador. Canenguez was a “good man and a good friend,” says one former co-worker. Moreover, Salvadoran police are notorious for describing as enfrentamientos incidents that could more accurately be called extrajudicial killings. In some cases, local media have proven that police intentionally misidentified victims of police shoot-outs as gang members to avoid consequences. The killing put Canenguez on an ever-growing list of Salvadorans who have died at the hands of security forces and gangs after being deported from the United States. World Politics Review has been able to count at least 70 deportees who have been murdered in El Salvador in the past five years, a toll that reflects information available in local media reports; documentation by NGOs; and research conducted by Elizabeth Kennedy, an independent analyst who focuses on violence and migration in the so-called Northern Triangle countries of El Salvador, Guatemala and Honduras. After spending years in the U.S., many deportees don’t have the knowledge they need to navigate gang-controlled areas safely. At least 20 of these murders have occurred in El Salvador since 2016 alone. They are often officially blamed on gang activity, though other victims suffer a fate similar to Canenguez—being killed in murky circumstances involving the police. Many deportees don’t survive back in El Salvador nearly as long as Canenguez did. In March 2017, Benjamin Martinez, 19, was shot 30 times in the town of Lourdes while returning home from the gym. He had been deported from the U.S. just a month earlier. Police say they believed he had gang links, a claim that the office of El Salvador’s attorney general said should be investigated further. Three months later, Misael Antonio Lopez Caballero, 30, arrived back in El Salvador after being deported from the U.S. and was murdered outside his house in the town of Los Amates that very day. Police did not immediately identify a motive, but they told local media he could have been involved in a gang. Such cases underscore how a deportation order can be a death sentence in a country where there were nearly 4,000 murders in 2017. That’s almost 11 murders a day, or about 60 murders a year for every 100,000 people. By comparison, the number of murders per 100,000 people in 2017 was three in New York City, seven in Los Angeles and 24 in Chicago. The violence is driven largely by MS-13 and 18th Street, gangs that were born decades ago on the streets of Los Angeles. The harsh policing response means the authorities are also a threat to citizens; there were 1,325 deaths recorded at the hands of the security forces between January 2014 and June 2017. The dangers for deportees are compounded by the fact that, after years in the U.S., many don’t have the knowledge they need to navigate gang territories in El Salvador safely. Prior gang affiliations or tattoos associated with gangs add extra risk. July 2, 2018 (AP photo by Salvador Melendez). The majority of deportee murders identified by WPR involved men between the ages of 19 and 40 in areas with a significant gang presence. In general, murder victims in El Salvador are overwhelmingly young men from poor neighborhoods, though women are also at risk, and they face rampant sexual and domestic violence. Yet the Trump administration is further restricting the conditions under which Salvadorans who come to the U.S. can seek asylum, while maintaining the current high rate of deportations of Salvadorans, some of whom have spent decades on American soil. To be sure, large-scale deportations of Salvadorans pre-date President Donald Trump. The Obama administration deported 20,538 Salvadorans in 2016 and 21,920 in 2015. Last year, a total of 18,838 Salvadorans were deported. But the Trump administration is targeting Salvadoran migrants in new ways, stripping them of protections that could allow them to seek legal status in the U.S. In August 2017, the Department of Homeland Security ended a program that allowed minors fleeing violence in Guatemala, El Salvador and Honduras to legally migrate to the U.S.
On Oct. 3, a federal judge in California granted a preliminary injunction against the Trump administration’s decision to end TPS for citizens of El Salvador, Sudan, Nicaragua and Haiti, citing evidence that the decision was racially motivated. Finally, in June of this year, U.S. Attorney General Jeff Sessions stated that domestic violence and gang violence were not legitimate grounds for seeking asylum in the U.S., a determination that stands to disproportionately affect Salvadorans, Guatemalans and Hondurans. The Trump administration is also ramping up so-called interior deportations, meaning deportations of people who live outside states bordering Mexico. These people are more likely to have lived in the U.S. for years or even decades and to have put down roots there. In its decision rescinding TPS, the Department of Homeland Security claimed that El Salvador had demonstrated an ability to effectively process deportees. Yet the available data on deportee murders suggests that the opposite is true. El Salvador is clearly struggling to protect deportees upon their return, and new arrivals are increasingly scared about what will happen to them. As the stories of Canenguez and many others show, they have every reason to be. Canenguez was first deported to El Salvador in 1998. When he returned, he was touching down in a country he hardly knew at all. He had left when he was just 4 years old, part of the first big wave of Salvadoran migrants fleeing the country’s civil war, which raged from 1980 to 1992 and killed at least 75,000 people. Canenguez tried to go back to the U.S., but he was deported to El Salvador for the second and final time in 2001. Perez says this second deportation may have been the result of a drug offense, but she doesn’t know the details. Canenguez’s mother, who stayed behind in the U.S., texted him daily, fearing for his safety. Her concerns intensified in 2013 when his half-brother, who had also been deported to El Salvador, was murdered after he fell asleep on a bus and ended up in an unfamiliar area controlled by a gang. The Trump administration is targeting Salvadoran migrants in new ways, stripping them of protections that could allow them to attain legal status. Perez never got the full story of how Canenguez made it through his early years in El Salvador, but she knows things were not easy for him. His father and half-siblings rejected him, preferring to keep their distance because of the problems that his appearance—specifically the tattoos that stretched from his neck to his wrists—could generate. Eventually he found work at a call center, where he met Perez. At the time, Canenguez had a 4-year-old daughter with a Salvadoran woman he had married; the marriage had ended in divorce. Perez, for her part, had recently separated from the father of her two children, and the pair bonded over their experiences as parents. “His daughter was everything to him,” Perez says. According to Perez, Canenguez felt as though he was under constant scrutiny in El Salvador, and it’s true that because of his tattoos, he drew stares whenever they boarded the bus or went out to eat. Often, Perez says, it was hard to tell if people were scared of him or if they posed a threat. In El Salvador, tattoos have been associated with gangs since at least the 1990s, so the general population shies away from people who have them. 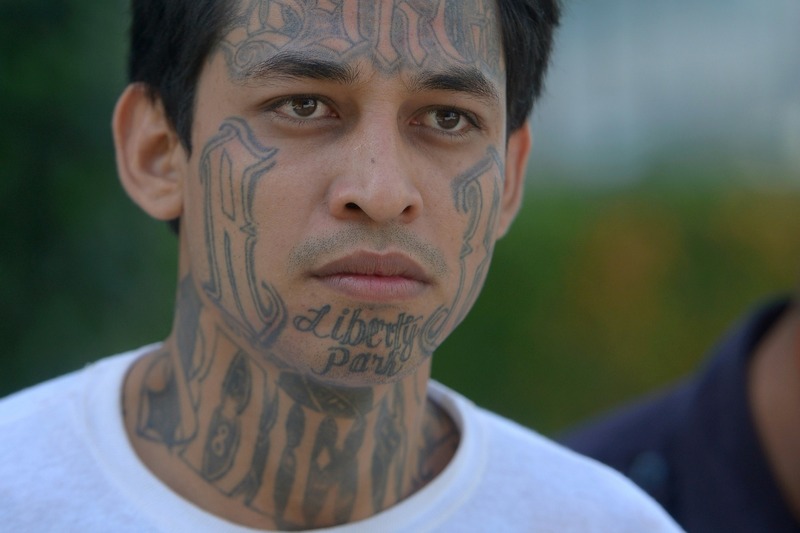 Gang members and police officers are more likely to target deportees because of their body art. Their co-workers also kept their distance because of Canenguez’s appearance, Perez says. When she started going out with him, her friends told her to be careful, warning her against trusting someone with so many tattoos. Back in 2001, when Canenguez was deported for the last time, the mechanisms in El Salvador to help deportees were less developed than they are today. In recent years, the government has implemented programs intended to make the transition easier. On a recent Wednesday afternoon, more than 100 men and women who had just arrived in El Salvador after being deported from the U.S. sat in rows of plastic chairs at the Center for Integral Attention of Migrants, or CAIM, in San Salvador. A Salvadoran official stood at the front of the room to explain what would happen next. He said deportees heading to areas in the far west of the country would complete their interviews with immigration officials first, while those staying in or near San Salvador would be processed last. The official then distributed the deportees’ belongings, which had been collected in red mesh bags and held in a separate cabin during the flight. Some bags were nearly empty, with just a few papers and documents, suggesting a quick deportation after crossing the border. Others were full of clothing, shoes and other personal belongings that hinted at years spent building a life in the U.S. When deportees are interviewed at CAIM, they have the opportunity to express any fears they might have about living in El Salvador, explains Hector Aquiles Magana of CONMIGRANTES, an agency within the Ministry of Foreign Affairs that works with deportees, migrants and their families. Deportees who feel they are in danger are referred to the Office for Victim Attention, which falls under the Ministry of Justice and Public Security. The agency helps to find a safe place for these people to live, away from whatever threats they might have cited. nighttime patrol in San Salvador, El Salvador, Aug. 21, 2018 (AP photo by Rebecca Blackwell). But in a country where almost any town is less than a three-hour drive from the capital, relocation does not always provide protection. And the government only tracks individual cases for about a month. Beyond programs to ensure their physical safety, deportees require support in the form of health care and job placement assistance. The government’s 2017 reintegration program for deportees, “El Salvador is Your Home,” aims to provide comprehensive support services. But organizations working with deportees in El Salvador say the program is underfunded and that deportees don’t get the help they need. Civil society groups criticize the government for not dedicating enough resources to deportees and instead outsourcing the problem to NGOs, churches and other independent organizations. 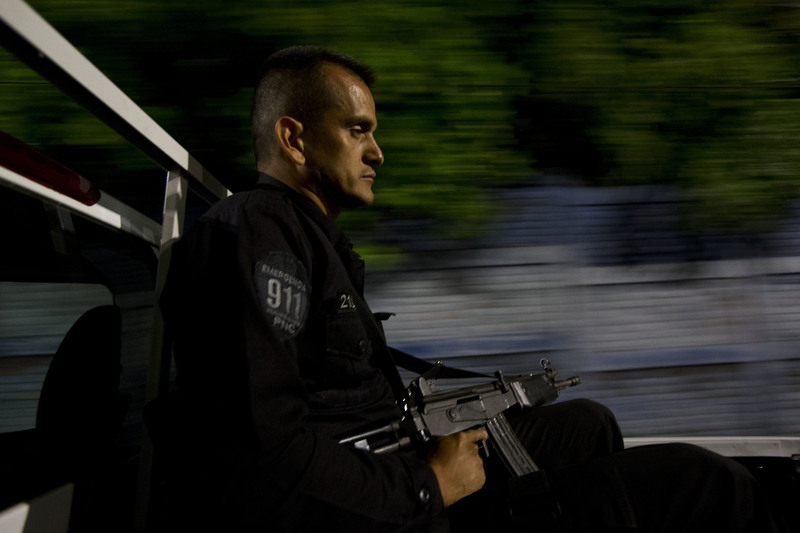 “The state doesn’t have the capacity to attend to a problem of this dimension,” says David Ortiz, who works in gang hotspots in San Salvador and the surrounding area. He asked that the organization he works for remain anonymous so as not to put its work at risk. The government struggles to properly fund basic services like health care and education for the entire population—not just deportees. Given the vast array of security and infrastructure issues officials must contend with, deportees aren’t always a top priority. In El Salvador, where one wrong move in a gang territory can be deadly, there exists a set of unspoken rules one must follow in order to survive. Every day, residents make countless calculations to try to minimize risk—what bus route to take, at what time, where to sit, what to wear, who to talk to, who not to talk to, how long to make eye contact, when to smile, when not to smile. In the capital’s gang-controlled neighborhoods, no one enters unnoticed. Young gang-members often serve as lookouts, and cars are expected to enter with their windows down so the lookouts can see who’s inside. Activists say the government has outsourced the challenge of reintegrating deportees to NGOs, churches and other independent groups. New people entering such neighborhoods often set off red flags, and some attract more scrutiny than others. Gangs can recognize deportees by the way they dress, which is influenced by American brands and style. Deportees also have a different way of speaking Spanish that is easily identifiable. Since they grew up in Latino communities in the U.S., some deportees use slang words from other Latin American countries that are not common in El Salvador. They also pepper their Spanish with English words that monolingual Salvadorans don’t understand. 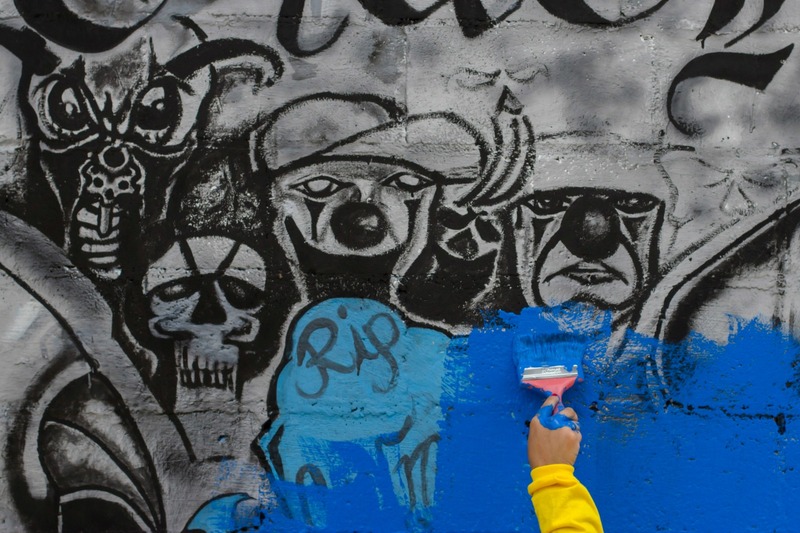 Gangs have had a large presence in El Salvador since at least the 1990s, after the country’s long and bloody civil war. But their brutality has steadily increased over the years. In 2015, violence in the country surpassed civil war-era levels when a truce between the MS-13 and 18th Street gangs fell apart. Newer deportees are often clueless about how to negotiate this challenging and unfamiliar terrain. Among those waiting at the CAIM office on the recent Wednesday was Mauricio Garzona, a 27-year-old who had left El Salvador for the U.S. when he was only 11. Most of Garzona’s years in the U.S. were spent in Long Beach, Calif. He was deported after serving six months in a county jail in California for grand theft. He left behind his mother, sister and 8-year-old daughter. Garzona was one of the last to leave the deportation center, at around 4 p.m. that day. He still didn’t know exactly where he would go. Victor, a Salvadoran who grew up in San Francisco and was deported in 2010 after serving time for a drug offense, is used to cases like Garzona’s. He runs a support group for deportees who are known as desarraigados, or people with no roots. “These people were born in El Salvador, left in the 1980s or 1990s and were raised in the States. They know the U.S. culture. They like Kid Rock or NWA. They don’t know anyone here, or they don’t know where to go,” says Victor, whose name has been changed to protect him and his organization from unwanted attention from gangs. As Canenguez learned all too well during his 17 years in El Salvador after being deported, gangs aren’t the only threat deportees face. The police also target deportees based on their preconceived notions about who they are and what they’re doing. One day in January 2017, while in their car heading back from work, a police car pulled up next to them at a red light. The officers got out and approached the car—two on the passenger side, where Perez was sitting, and two on the driver’s side, where Canenguez was. All four officers were holding shotguns. The police suspected that Perez and Canenguez had taken photos of them, and they demanded that the couple get out of the car to show their cell phones. They complied, but the police didn’t find any photos. After forcing Canenguez to take off his shirt, the police asked for his ID to run a check on his record. Perez says they “got annoyed” when his record turned out to be clean. They then forced the couple into the police car and took them to a police station, holding them for less than an hour before letting them go. Soyapango, El Salvador, June 21, 2016 (AP photo by Salvador Melendez). On another occasion, in 2016, the couple went out to a dance near where they lived in Cojutepeque, a city about 45 minutes outside San Salvador. When they arrived at the door of the venue, a police officer said they couldn’t enter. They forced Canenguez to strip down to his boxers to be able to see his tattoos, some of which had references to Los Angeles. Perez insists that none of Canenguez’s tattoos were gang-related. Again, the police ran a check and called various police stations to see if Canenguez had a record, but found nothing. Perez says the police then hit Canenguez multiple times before they would let the couple go. She recalls at least one other instance this year in which police hit Canenguez for no apparent reason. And these are just the run-ins she witnessed herself. Because Canenguez was alone during his final encounter with the police this past May, the exact circumstances of his death are unknown. Perez and other friends have tried to reconstruct exactly what happened based on their communications with him. After staying the night at Perez’s house, Canenguez remained there the following Sunday morning. Around 12:30 p.m., he told Perez over the phone that he was leaving to come to the city. Some friends in the neighborhood saw him near the house around 1 p.m., so he probably left shortly after that. From there, he planned to drive to another friend’s house just north of San Salvador, and he let her know he was on his way. He had some time before he would pick Perez up at 4 p.m. But he never made it to the friend’s house. Around 2:30 p.m., he called two friends, but neither picked up. At some point during his drive, Canenguez crossed paths with a police car. Officials later told local media that the police wanted to pull him over and that he tried to escape. They also said he started shooting at the police. “Every time that I think of him, tears come out,” she added. About three months later, Perez thought about trying to investigate his death, but she hasn’t been able to get much information. Since she doesn’t have Canenguez’s ID card, which she believes he had with him at the time of his death, she has hit several bureaucratic roadblocks. Canenguez is survived by two children—the daughter he had with the Salvadoran woman, now 7, and a son, who is now an adult living in the U.S. At the time of his death, he and Perez were planning to move in together. Anna-Catherine Brigida is a freelance journalist covering immigration, human rights and security in Central America. Her work has been published by The Washington Post, The Guardian, Al Jazeera and other outlets.